First, let dispense with the obvious: In answer to the question you posed, the U. S. Mint's first commemorative coin was the emission of 1848 Philadelphia quarter eagles counterstamped CAL. in January of the following year to denote that they were coined from gold of the new California mines. Recovering from my recent surgeries gave me a lot of down time at home, and it was inevitable that I'd run out of current magazines and newsletters to read. Fortunately, I have many books that were purchased years ago and quickly shelved for another day. One of these is a two-volume oral history anthology titled San Francisco Memoirs, compiled and introduced by Malcolm E. Barker. In Volume Two, which covers the post-Gold Rush years 1852-99, I found a really interesting account of a traveler's experiences with money in and around San Francisco in 1869-70. William Fraser Rae published this account in 1871 within his own book, Westward by Rail: The New Route to the East, which was evidently intended for his British readers. "I went along Montgomery-street, which is the Regent-street and Lombard-street [London], or Broadway and Wall-street, of this city...Bankers' offices are very numerous. Their windows are filled with the paper-money of all nations, from the plain white notes of the Bank of England to the elaborately figured 'greenbacks' of the United States. These 'greenbacks' are not current in California. The State stretched its legal rights to the extreme point of refusing to accept as currency what Congress had proclaimed legal tenders. Nothing passes current here save gold and silver coin. Even the nickel and copper cents of the Eastern States are unknown. They are looked upon as curiosities. Men wear them on their watch chains just as some Englishmen wear 'spade' guineas. "On my arrival at the hotel, a Californian who had brought some of these coins from the East was besieged with inquiries for them. Many persons had never seen one, and to them they were as great novelties as African cowries would be to us. Small sums are reckoned in 'bits,' which are imaginary coins having the nominal value of twelve and a half cents. Indeed, the absence of single cents causes something worse than confusion. A newspaper costs ten cents. Suppose that a quarter dollar, equal to twenty-five cents, is presented in payment for the newspaper, the seller will probably return a dime, which is equal to ten cents. Thus fifteen cents have been paid instead of ten. 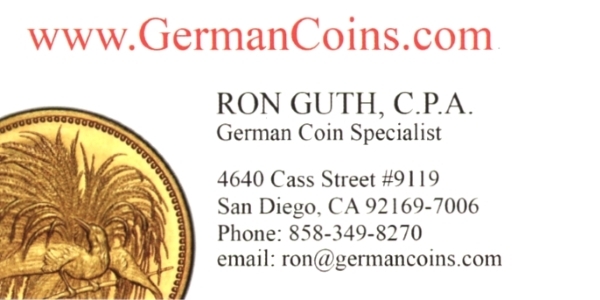 His excuse will be that he has not any half dimes, these coins being extremely scarce. In California this is taken as a thing of course by the natives and the residents. The visitors, however, are apt to regard it as an imposition. 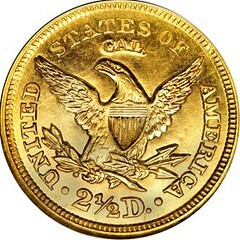 "The gold coin generally current is the twenty-dollar piece. It is about the size of half a crown, is worth nearly five pounds sterling, and is a very beautiful coin. 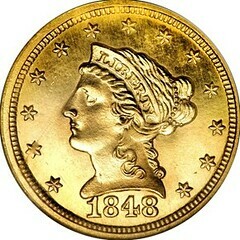 The inhabitants, who are accustomed to high prices, part with these coins far more readily than we part with sovereigns." There are several points of specific interest in this account. It's already well documented that paper money was shunned in California, yet it was available more in San Francisco as a curiosity than as a routine medium of exchange. It's possible that it may have been useful for discreetly mailing money to others, and fractional currency notes were used in this manner for many years after their discontinuance. It also confirms that nothing smaller than a dime was in general circulation in California. The writer evidently didn't know that a "bit" had indeed been an actual coin, the Spanish one real piece, and it still survived as a unit of value even after the coins ceased circulating. There is also confirmation of what many in Congress considered to be a fantasy concocted by Western silver interests to justify adoption of a 20-cent piece in 1875. Several years prior to that date there was clear evidence that the absence of a circulating five-cent piece was a problem, though one that most were content to ignore. While half dimes had been coined at the San Francisco Mint regularly since 1863, few were in circulation, and this may be explained by the fact that jewelers bought them up for fashioning into charms, buttons and pendants. Mark Twain famously wrote of the disdain he was shown by a miner upon offering a half dime as payment of some small sum, so there seems to have been two schools of thought regarding its usefulness in western commerce. Finally, the routine usage of double eagles in circulation helps to explain why so many, particularly San Francisco Mint coins of the 1850s-70s, are found obviously worn.